The inlet baffle of your treatment tank is designed to prevent the incoming wastes from stirring up the contents of the tank. When the tank gets stirred up the solids don’t settle out and they flow over into your drain field. Eventually this causes a failure of your drain field. Baffles sometimes clog with soap, grease, detergent and other waste products. They can be cleaned through the inlet baffle inspection port. Outlet baffles are probably the most important component of your treatment tank. They prevent the floatable solids from flowing from your septic tank to your drain field. An outlet baffle is a vertical tee or shield that covers the outlet pipe and extends down into the tank a distance equal to 40% of the liquid level of the tank. Inlet baffle inspection ports are risers over the inlet baffles that extend to the surface of the ground. They are supposed to be 4” in diameter and be air tight. Inspection ports installed prior to 1983 were required to be 6” in diameter. Inlet baffle inspection ports are for checking the condition of the inlet baffle, checking for leaks, and clearing a stoppage in the inlet baffle. To inspect the condition of the outlet baffle. To run a jet, snake or video camera through the outlet line of the septic tank. 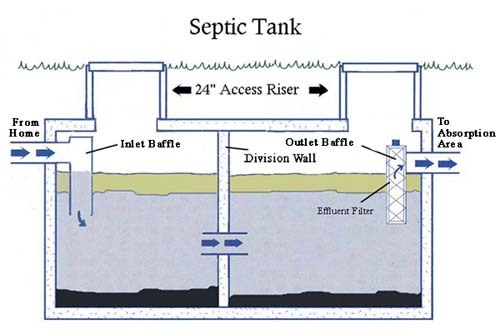 Septic tanks also have a main access port for cleaning the tank. Main accesses are needed to enable the treatment tank(s) to be cleaned without having to dig down to uncover the lids. PADEP requires that the lids are to be no deeper than 12”. It is preferable for them to be on grade so that you never have to pay to dig them up. The accesses are supposed to be at least 20” square or 20” in diameter. They need to be secured to the tanks so that they are water tight. The typical way to secure them is by placing a butyl tar strip between the riser and the tank. It is important that the tank lid is secure, structurally sound, and heavy enough that a child can not lift it for safety. There are two types of lids you can install on your main access. One is concrete. A concrete lid must be at least 3” thick and be reinforced with wire or rebar. Concrete lids are the least expensive. They are recommended if the lid will be below the surface of the ground. You can also install a plastic lid. A proper plastic lid can support the weight of a lawn tractor. It has a gasket to hold odors in and keep water out. It also has stainless steel screws to secure the lid to the access pipe. Plastic lids are recommended when the lid will be installed on the surface of the ground. The main access must be made of H.D.P.E. inorder to accept the screws of the lid. The lids we sell are green so they blend in with your lawn. Some tanks have an effluent filter in the outlet baffle. An effluent filter is a device that you insert into the outlet baffle of the final compartment in your treatment tank. There are many different makes and models. After studying their performance and trying many different types, we believe the best value is a sim-tech filter. It will make your treatment tank 40% more efficient in retaining solids. Effluent filters, like all filters, need to be cleaned periodically usually can be cleaned once a year. Some need to be cleaned every six months. A few customers need to clean them every three months. You can clean them yourself or we can clean them for you. They are very inexpensive to buy. You can even buy a supply of them and throw them in the trash and install a new one.